I figured with Zach Johnson winning this past weekend it was time to finish my review of the SeeMore FGP Stainless Steel putter. You can see my first impressions of the putter here after some early season rounds. You have to love the SeeMore Putter Company just for the fact they're the little guy out there in the sea of large corporate golf companies. Hell pro golfers play SeeMore putters because they like them not because they're getting paid to like them. Zach shoots an incredible 3d round 60 and then win a sudden death playoff on Sunday with a dramatic, 10-foot birdie putt on the first playoff hole. The 60 on Saturday means Zach now holds the last 2 scores of 60 or below shot on the PGA Tour, a stretch accounting for over 25,000 rounds of golf on tour. And he is the first person in the history of the PGA Tour to ever record 2 scores of 60 or better over an entire career, recorded with 2 different SeeMore putters. So will the SeeMore FGP Stainless Blade putter help a 20 handicap golfer? Read on. The look of the FGP blade putter in black satin finish is beautiful I loved the way it frames the ball. When you align the putter using the RifleScope Technology you just feel like your going to make more putts, the look definitely instills confidence. 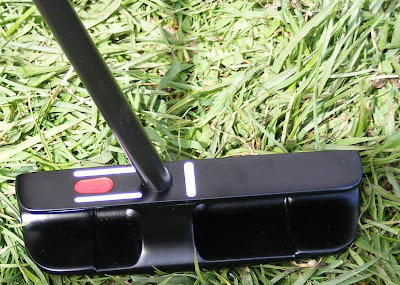 For me I've always loved the look of a dark finish on putters and I think SeeMore has a real winner with this finish. It has so far held up well after some early season rounds and some less then predictable Canadian weather. The head cover for the FGP is very unique and I've never seen anything like it before. The cover locks onto the shaft so you never have to worry about losing it, a great idea by SeeMore. The first time I used this putter I had 5 one putts in a row. These were all on putts about 20 feet and shorter. This unfortunately didn't continue. I found the FGP to be pretty good on shorter putts in the 10-15 ft. range and where FGP really excelled were those tricky short putts of 6 ft. and under. I loved this putter when I was close to the hole. Unfortunately I wasn't always close to the hole (I'm a 20 handicap golfer right) and found on longer putts 30+ ft. I didn't get the nice feedback I was accustomed to with shorter putts. Probably just chalk this up to being a 41 year old hacker and not having enough practice with distance control. 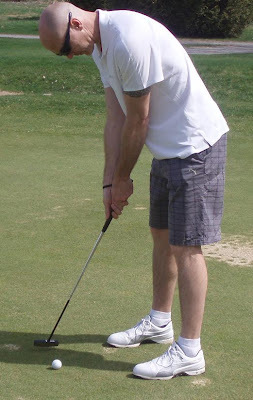 On pretty much all longer putts I was either too short or too long. So as far as being more accurate with the FGP putter. I definitely wasn't only with the short putts. I really liked the RifleScope Technology as it made for a proper set up each time you putt. I think that's why the shorter putts were money most of the time. The longer putts as I said earlier are still a work in progress with most of my misses going to the right and probably something with a little practice might improve. I really liked a lot of things about the FGP putter including the the success I had with short putts and the general overall look of the putter. The price of the FGP putter is also very reasonable considering putters of the same quality sell for double or more. You can pick up a FGP putter at Golf Town right for $159.99. Will the FGP putter knock my current mallet putter out of the bag probably not because as a high handicap golfer and the troubles I had with longer putts with the FGP I need something that's going to be more forgiving all around (SeeMore does make a mallet putter though). I could always go to carrying 2 putters kind of like what Phil Mickelson did awhile ago carrying two drivers. Never say never right! It was rather interesting for me to read the blog. Thanks the author for it. I like such themes and anything connected to this matter. I would like to read a bit more on that blog soon. As we can see,stainless steel has a lot of use even on sport materials.My dad will surely love to see your blog as well.He is playing golf once every month. The head cover for the FGP is very unique and I've never seen anything like it before. It's a great idea. And I like the benefits here in SeeMore Putter Company. Stainless steel are multifunctional source of materials.It does not stain, corrode, or rust as easily as ordinary steel, but it is not stain-proof.That's why even in sport they use it as a material for greater strength.